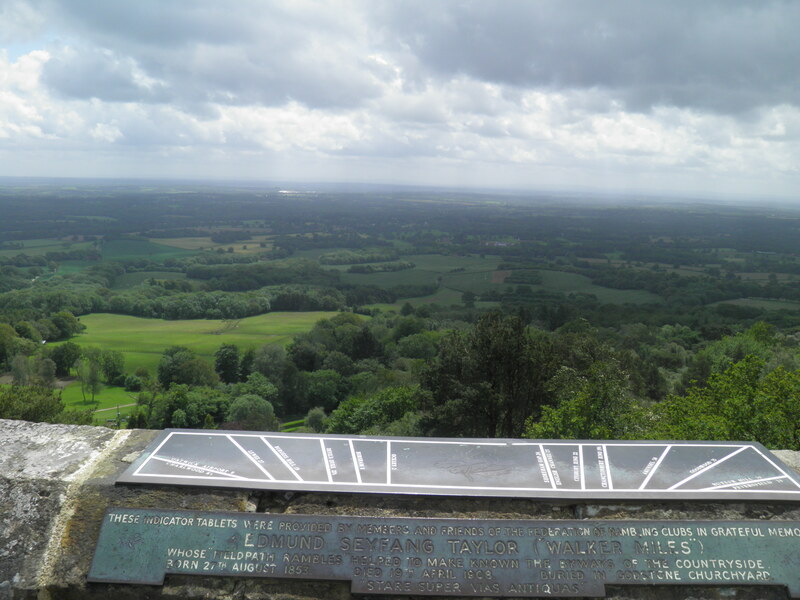 From windswept commons below the North Downs escarpment, this walk climbs gently through beautiful villages, past ancient farms and through verdant woodland to Leith Hill, one of the highest points in south-east England, with a stunning 360-degree panorama from its viewing tower. 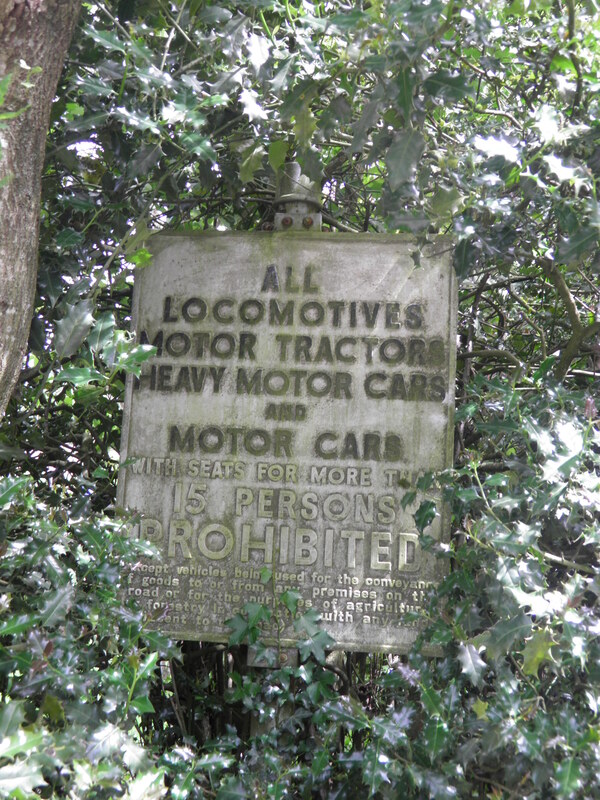 Important note: this walk cannot currently be done wholly by train on a Sunday due to the Dorking-Horsham line on which Holmwood is situated having only a Monday-Saturday service. See ‘Getting home’ below for details of alternative bus services. 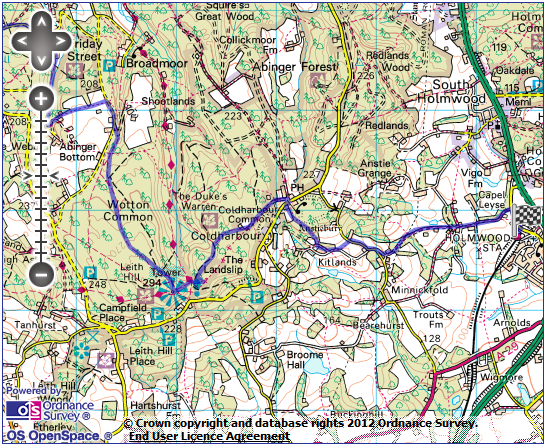 Underfoot: Generally dry upland paths and minor roads throughout much of the route, though there are a number of short stretches of bridleway that will be muddy after wet weather. Terrain: Despite climbing to one of the highest points in the region, the ascent is incredibly gentle, albeit lengthy. 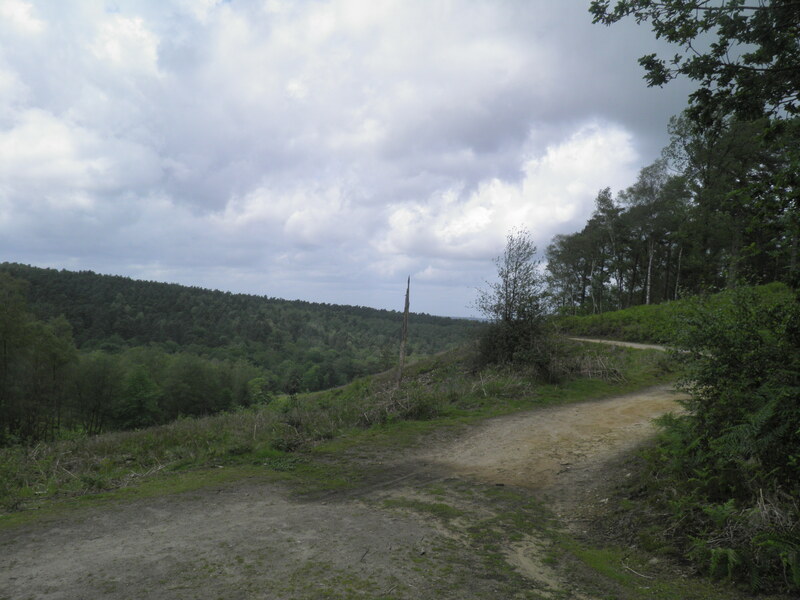 There are, however, a number of steep descents both before and after Leith Hill. Maps: 1:50,000 Landranger 187 Dorking & Reigate; 1:25,000 Explorer 145 Guildford & Farnham and 146 Dorking, Box Hill & Reigate. Getting there: Gomshall is a minor station on the cross-country North Downs line with a Great Western train every 2 hours in either direction, so it is necessary to plan your journey in advance. You can either travel via Redhill or via Guildford. Redhill has 2 Southern services an hour from London Victoria (28 mins) via Clapham Junction 22 (22 mins) for connections from London Waterloo and 4 services an hour from London Bridge (36 mins) via Norwood Junction (23 mins) for London Overground connections. All 6 trains call at East Croydon (12-18 mins). From Redhill, First Great Western run a train every 2 hours to Gomshall (19 mins). Guildford has 4 fast Southwest trains services an hour from London Waterloo (33 mins), 2 of which call at Clapham Junction (31 mins) for connections from London Victoria. 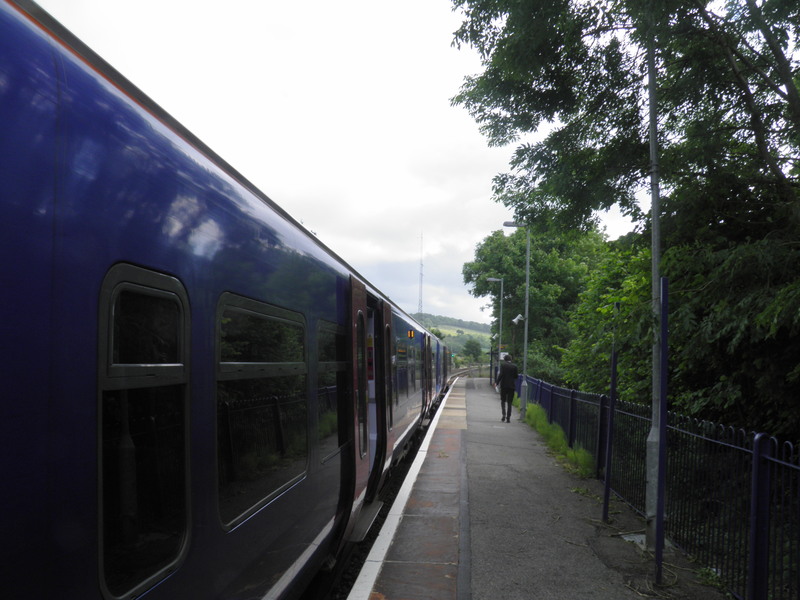 From Guildford, First Great Western run a train every 2 hours to Gomshall (16 mins). Note that travelling via Guildford is significantly more expensive than via Redhill. 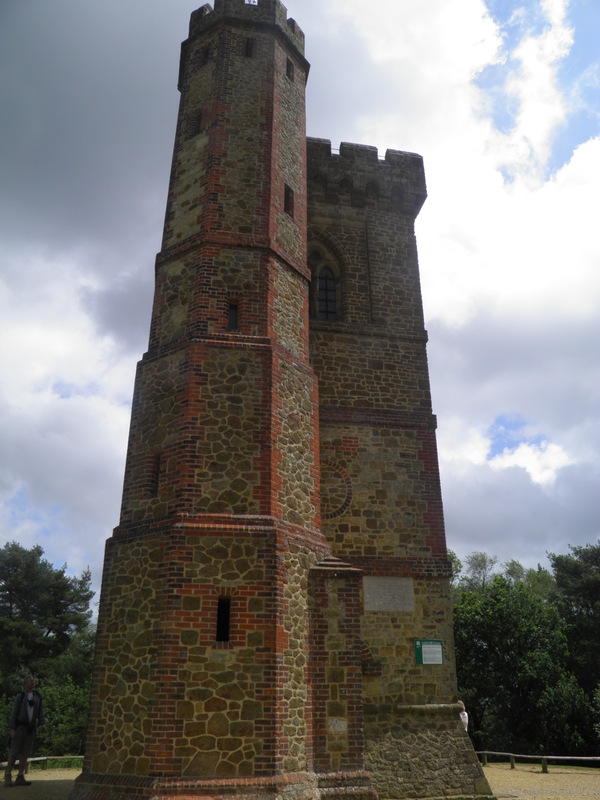 Useful websites: The walk climbs to the National Trust land and tower at Leith Hill. On the descent, it passes below the wooded ramparts of Anstiebury hill fort. Getting home: Note that there are no trains from Holmwood on a Sunday. Monday-Saturday, Southern operate one train an hour from Holmwood to London Victoria (59 mins) via Sutton (33 mins) for connections to London Blackfriars and St Pancras and Clapham Junction (51 mins) for connections to London Waterloo. 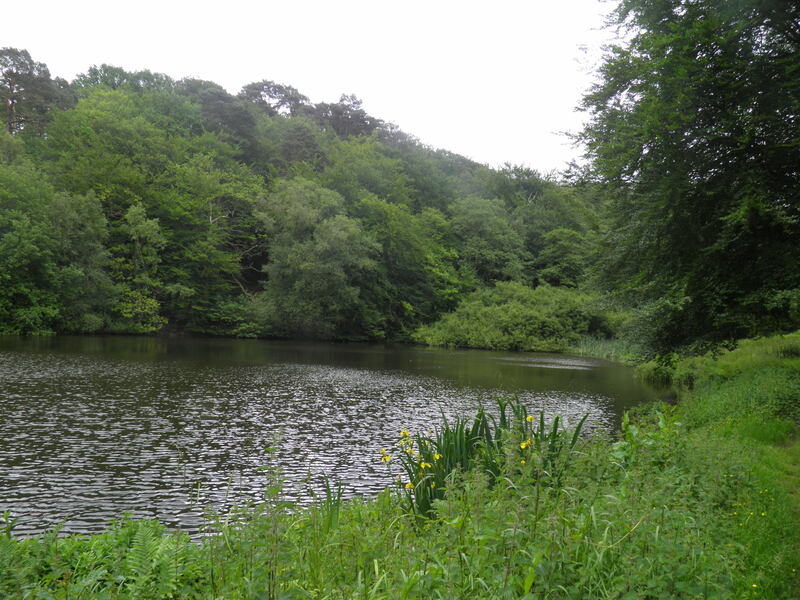 If you do wish to do this walk on a Sunday, you will need to use the 93 Metroline bus, which runs every 2 hours from outside Holmwood station to Dorking, from where you can connect into train services to London Victoria or Waterloo. Timetables for the bus can be found here. Note that the timings for Holmwood station are marked in the timetable as Beare Green, the actual name of the village that the station is situated in. at the western end of the platform. Arriving from Redhill, simply turn right at the eastern end of the platform. Follow a fenced path to drop down a track to the busy A25 at the bottom. Cross with care (there is poor visibility here) and turn right along the pavement to a railway bridge. Immediately before the bridge, turn left on Wonham Way (footpath sign). The track leads through the garlic-scented woods of Gomshall Marsh, before swinging left by Twiga Lodge, climbing gently through meadows. 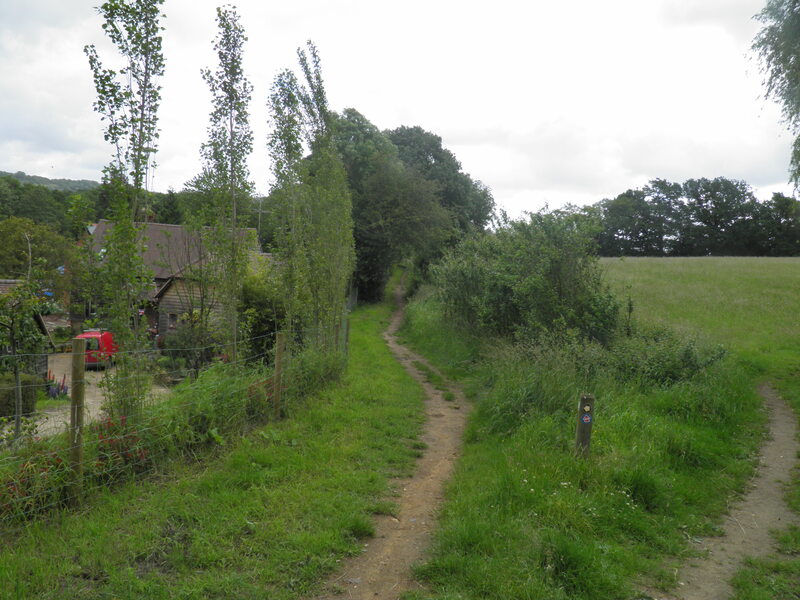 At a corner by Southbrooks Farmhouse , take the track left (following a bridleway waymark), then at a fork veer slightly right (bridleway waymark) to leave the track and keep above The Barn. Keep left at the fork immediately afterwards. The path drops slightly and at bottom turn right onto a concrete track which crosses a steam, keeping ahead past pair of semi-detached houses to return to the A25, opposite picturesque Hunters Moon Farm. Turn right along pavement into Abinger Hammer. 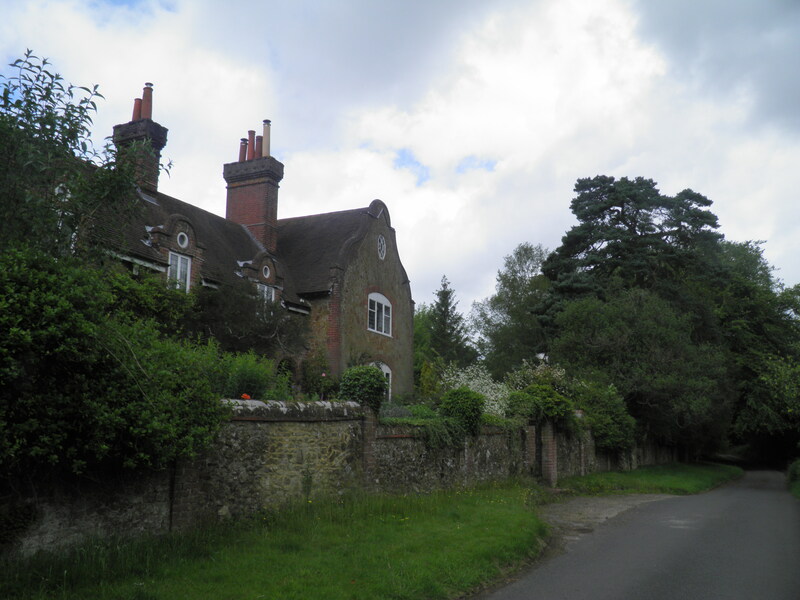 Just beyond the former Abinger Arms, now a cookery school, note the unusual clock structure ahead, then cross the A25 with care just before it and take a dead-end road left (signed as cycle route to Dorking). damming of the River Tillingbourne, to provide power for a hammer mill, part of Surrey’s sizeable iron industry which developed in the 16th century. The pond, beyond the village, is now a watercress farm. 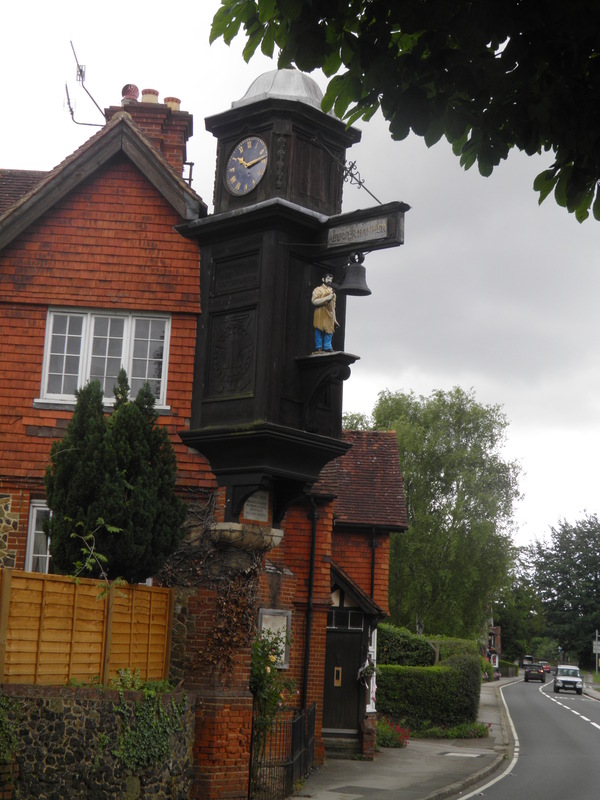 Today, Abinger Hammer and its fine village green is a popular local beauty spot, overlooked by the early 20th century Hammer Clock. The blacksmith figure (known as Jack) strikes the bell with his hammer every hour. The motto on the clock reads “By me you know how fast to go”. Beyond the cottages, the road curves up hill through a wooded cutting. At the top, head right at a bridleway sign. 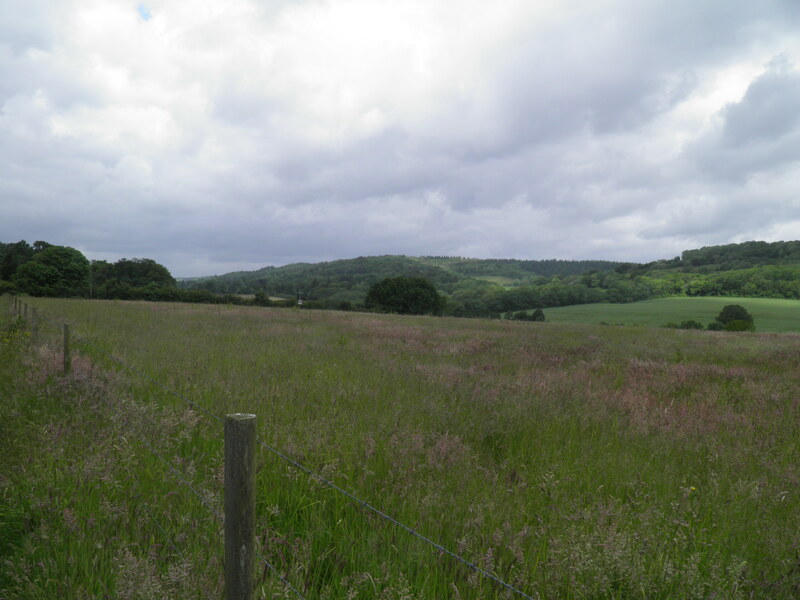 The fenced path leads across a low hilltop, with the North Downs escarpment to the left. Through a gate, you enter the open National Trust land of Broomy Downs, keeping to the track climbing ahead. From the top of the rise, the track drops gently through the woods to reach a small clearing. Here, leave the main track and take the grassy path veering R along the edge of the clearing. Keep straight ahead (there is a footpath waymark post hidden under an oak tree to the left). The path veers right as it re-enters the woods, before dropping steeply through the bracken. Cross a sandy path and keep straight ahead to exit the woods at a kissing gate. The path then cuts across a large meadow. From the end of the meadow, a clear path heads right through another kissing gate and wanders through the woods around the boundary of a large garden, before joining a short drive and reaching the A25 for the final time. Cross with care (visibility is again very poor) and take the footpath opposite. 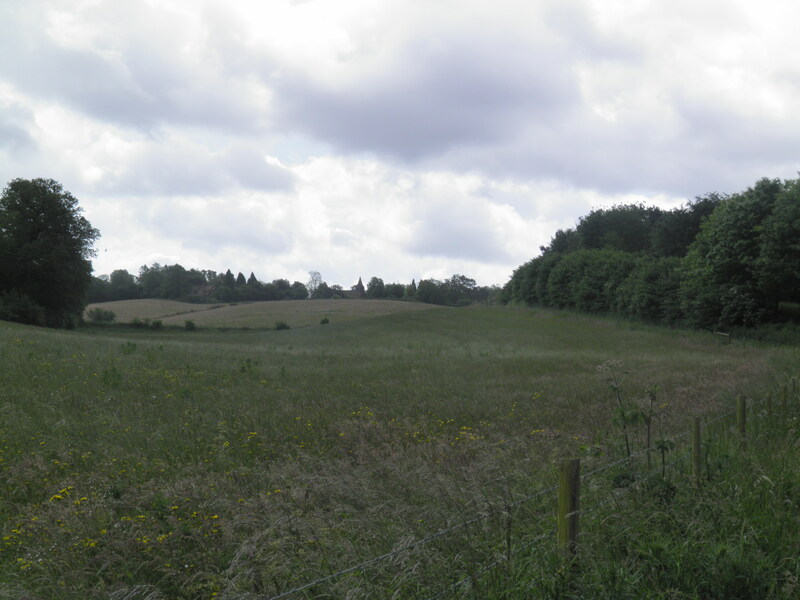 This cuts across the field beyond to reach little Raikes Lane, with fine early-17th century Crossways Farm (dominated by its huge chimneys) to your left. for a footpath sign to the left and follow it . Just after leaving the road, cross a field access track, following the fence on the left. The clear, but sometimes slightly over-grown path climbs very gently beside the fence, before dropping rightwards into a dry valley. 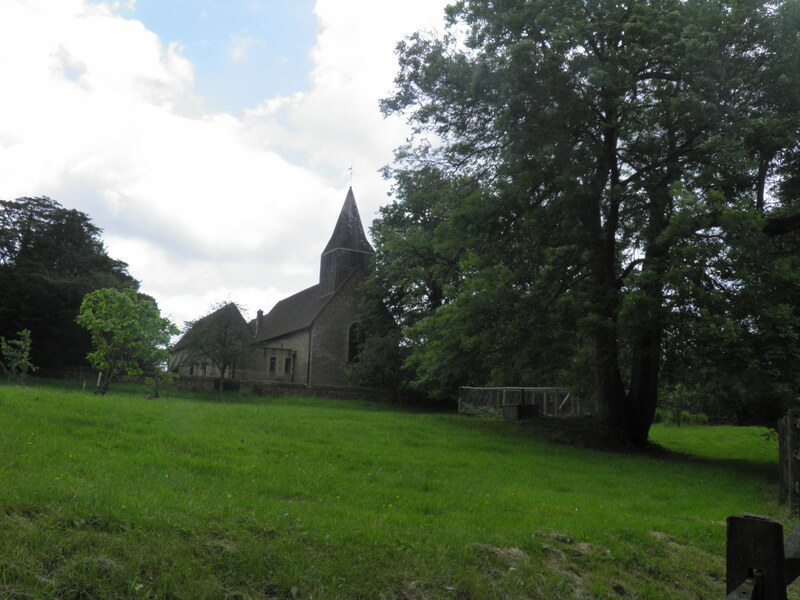 At the bottom of the valley  head left along a grassy track, climbing towards Abinger Common’s stubby church spire on the hilltop ahead. The track twists uphill for around 500m. 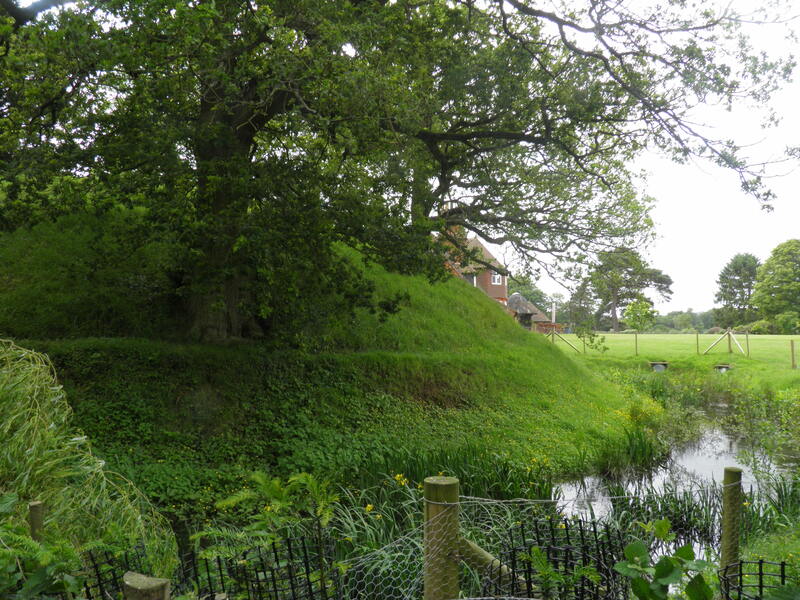 This is Abinger Manor Motte, an 11th century construction built by William fitz Ansculf, 15 foot in height and 12o foot in diameter. By the 13th century it would have had a stone tower, surrounded by a wooden palisade. There is no evidence of any occupation of the site after this period. 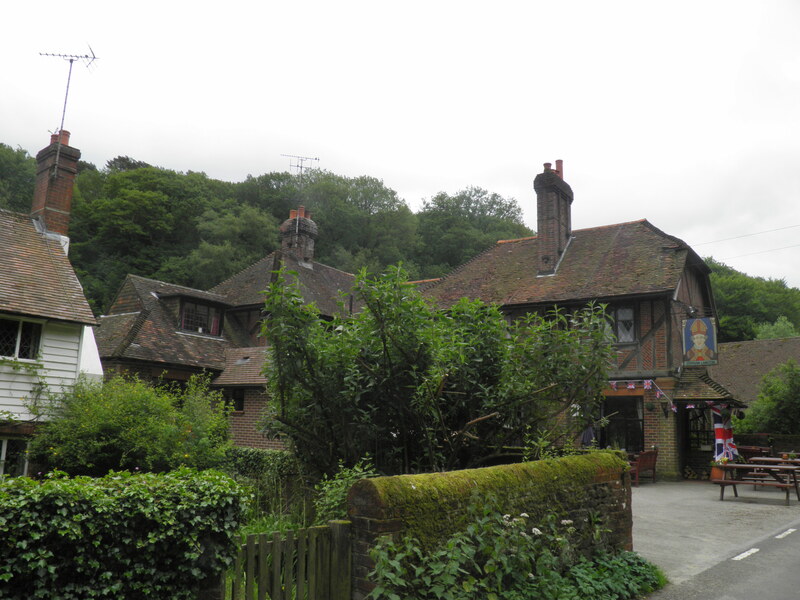 Abinger Hatch pub. Turn right on the road and after about 20m take the unsigned narrow road left (noticing the archaic cast iron ‘locomotives prohibited’ sign). 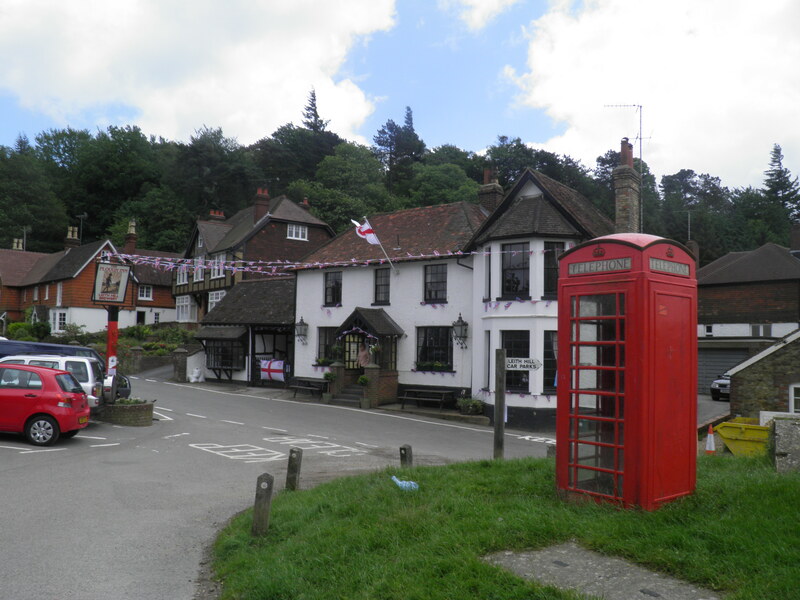 Abinger Common is probably the oldest of the three villages making up the parish of Abinger. The church of St James dates from the 11th century, with the existing nave being from that period – the church, remarkably, was bombed during World War 2. The road drops steeply to Glebe House and around 200m beyond, reaches a larger, busy road. Turn right and after a short distance  follow the bridleway sign to the left along a sunken path through the woods (this path can be very muddy after wet weather, so you may want to continue straight ahead for another 200m, then take the minor road towards Friday Street to the left instead). From the top of a rise, the path drops gently to a minor road, where you head left. Keep to this road as it passes through the spindly woodland and past a car park, before dropping steeply to the mill pond at Friday Street. ironworks – the road straight ahead runs across the top of the sizeable dam. It has been claimed that Friday Street was the birth place of Stephan Langton, a 13th century Archbishop of Canterbury, who was influential in forcing King John to sign the Magna Carta. There is absolutely no evidence for this, and is likely to be a myth created by a 19th century entrepreneur, but the hamlet’s pub now bears Langton’s name. the inn, the road quickly narrows and soon becomes a bridleway leading through the woods along the valley bottom. After a lengthy walk through the woods, you reach a small road by a cottage . Head left. Immediately after the cottage, look out for a small plank bridge across the stream to the left and cross it (no footpath sign at time of writing). The first few paces are often a little overgrown but you are soon on a clear path climbing up the wooded valley side. On reaching a track, you follow the footpath sign along the left-hand fork. Take the path climbing between the house and a gateway at the bottom of the drive . The sometimes narrow path climbs, following the fence on the left. 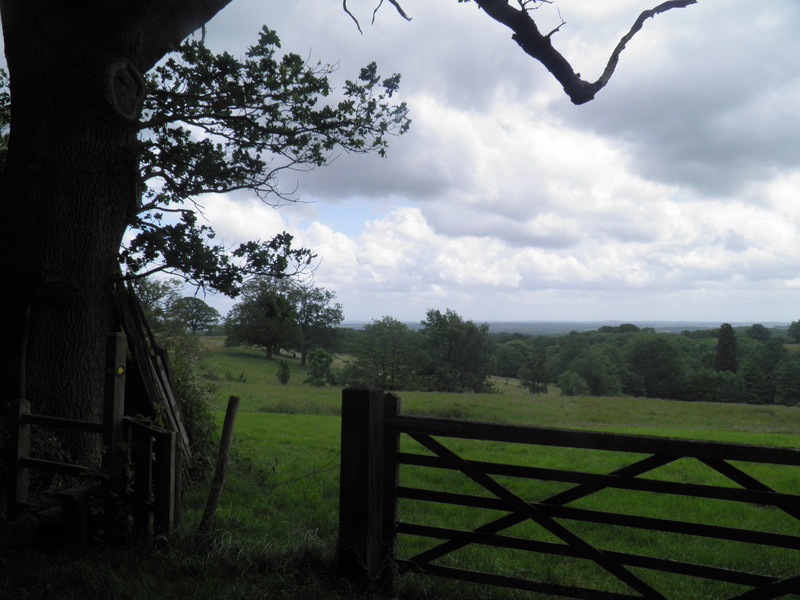 At the top of the climb, you pass through a kissing gate then follow the field edge ahead. 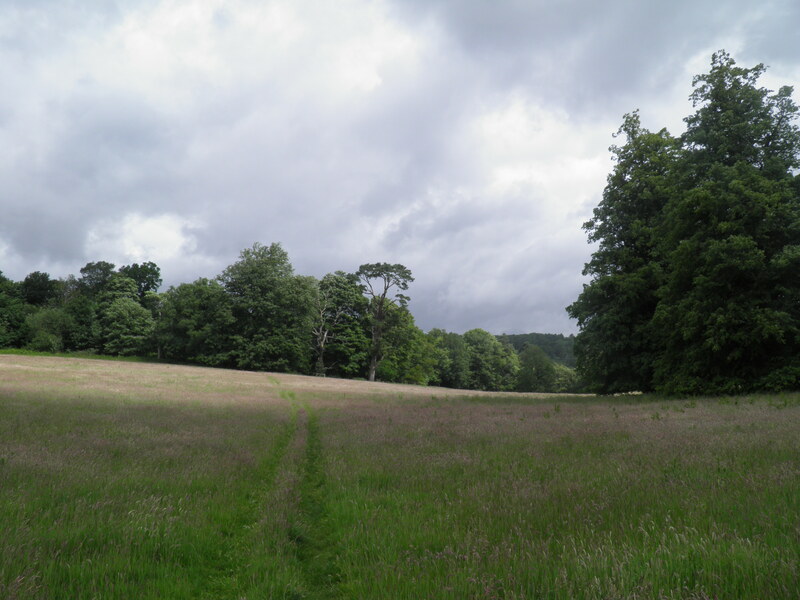 Reaching the end of the field, cross a track and follow the fenced path ahead to reach a minor road. Turn right, past the attractive Jacobean-style house at Leylands . Opposite Wotton Barn, immediately after Leylands, head left on a gravel track (bridleway sign). Where the main track hairpins to the left , head right at a bridleway sign on a broad path climbing gently up the wooded valley. away slightly, keep left (there is no sign here). This small path wanders through the delightful woodland, still climbing gently. On reaching an area with a lot of paths branching off, keep broadly straight ahead, dropping slightly through the rhododendrons. You soon join a larger path and bear left, which soon brings you to the tower on top of Leith Hill, with stunning views in all directions. Beauty. It is thought that Leith Hill was the site of a 9th century battle Æthelwulf of Wessex defeated the Danes, who fresh from sacking Canterbury and London, were en route for the Wessex capital at Winchester. The 20m tall tower was built in 1766 by the owner of Leith Hall, just below the hill. The views from the top on a clear day extend to the Channel coast and the London skyline, with Gatwick Airport in the near distance. It is open most weekends and on weekdays in the summer – tickets are sold at the servery in the tower side, which also sells tea, coffee and excellent cakes. 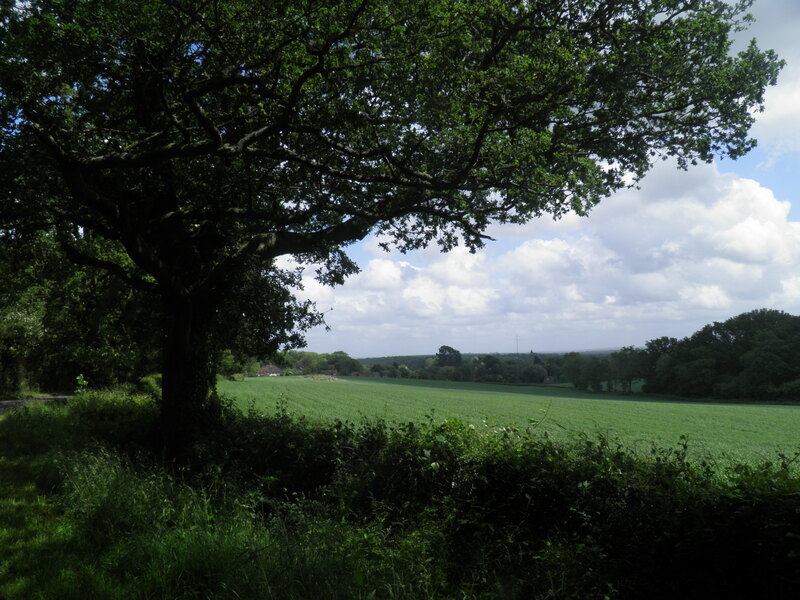 From the tower, take the broad path straight ahead, marked as the Coldharbour Common Walk (CCW). The path drops steeply to a large path junction . Keep straight ahead through a gate (still following CCW signs). The path climbs up onto an area of heathland, which you follow the blue bridleway waymarks across. Where you get a choice of routes, at the head of a valley , bear slightly left, leaving the CCW. by-way and keep straight ahead, descending through the trees to emerge in the pretty hamlet of Coldharbour by the Plough Inn. Turn right on the road, then almost immediately left on a signed footpath hidden past the first cottage. A stile leads you out into a field, keeping by the left-hand boundary to a gate, then another stile leading into the wood. A faint path leads below Anstiebury banks then downhill through trees. This can be a bit squelchy as you descend. Coming to a drive by Kitlands house, turn left. Where the tarmac ends, ignore the path to the right and keep straight ahead on a grassy track. Where the track forks , keep left into a field. Follow the left hand boundary to a minor road. Turn right, downhill past East Lodge. Just beyond, take a track left – marked with a rather unnecessary dead end sign. Join another track and swing left, downhill between hedgerows to a small stream valley. Beyond, the track becomes more substantial and eventually tarmaced as it drops past Moorhurst into a second small valley. Capel Layse, you get a final set of fine views across the lowlands to the south east. Where the road swings sharply left , keep ahead through a kissing gate onto a narrow path between hedges. This soon brings you out onto the old main road in Holmwood – now by-passed – where you turn right. The station entrance is about 100m along the road, just past the bus stop. A great walk – thanks so much for setting this all out so clearly. Very dry underfoot throughout right now, as you might expect; but still beautiful and green in the woodlands and most of the meadows. Keep up the good work please!